Over-the-counter teeth whitening treatments are affordable, but if your teeth are not in pristine shape, you may be wise to take advantage of professional teeth whitening treatments offered by a cosmetic dentist. The main benefit of professional teeth whitening is the expertise a cosmetic dentist has when it comes to teeth, particularly when they are not in perfect condition. If you have teeth with numerous restorations, such as fillings, crowns, and bridges, it’s wise to be cautious. People with tooth or gum sensitivities may also want to seek out a professional who can tailor treatments to avoid uncomfortable complications. And, if you have a big event around the corner, professional whitening will give you whiter teeth faster. 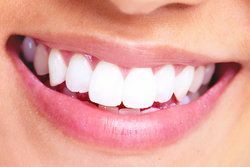 Dr. Michael Bixby at the Center for Advanced Dentistry in Red Bank can explain professional teeth whitening and determine if it’s the right step for you. Before anyone undergoes teeth whitening, over-the-counter or professional, the first stop is the dentist’s office to have your teeth examined. If you attempt teeth whitening with a loose filling or cavity, the whitening agent can seep into the tooth and possibly damage the root. In the worst-case scenario, you could end up needing root canal treatment. Whiter Teeth, Faster. Dentists use professional strength whitening agents that are not available over-the counter. A stronger solution equates to a quicker turnaround and whiter teeth. Most store-bought kits take two to four weeks before you see a marked improvement. At the dentist’s office, you can get results that are up to eight shades lighter in about an hour. Safety. If you have sensitive teeth or gums, a dentist can tailor treatment to your needs, adjusting the strength of the whitening gel or the duration of the treatment to allow you to get the maximum whitening with the fewest complications. Better Application. Over-the-counter methods often use one-size-fits-all trays to hold bleaching solutions against your teeth. But generic trays can’t hope to match the unique gum line in your mouth or that slight twist of a tooth, causing the bleach to leak onto your gums or to result in uneven whitening. A dentist creates a custom tray made from a mold of your teeth, ensuring a perfect fit and better results. Guidance. Not everyone is a good candidate for teeth whitening. A dentist can examine your teeth and advise you on the pros and cons of teeth whitening. A dentist can also give you realistic expectations about what you can expect and when you’ve reached your natural limit for whitening. Though whitening is regarded as safe, the treatment can be abused. Some people become addicted to the bling of white teeth and become “bleachaholics.” Over-whitening your teeth can make them brittle and turn them grey. Over-bleaching also can erode the protective enamel off your teeth. If you are thinking about whitening your teeth, please take the first step and have your teeth examined to ensure a safe and effective treatment, no matter what method you use. Please call today for an appointment.